"The greatest fairy tale never told." The movie Shrek is based on a peaceful creature and a princess. Shrek the ogre has lived peacefully alone in the swamp for a number of years. Shrek is about a princess that is trapped in a castle and is looking for her handsome price to come and rescue her. The princess is named Fiona and years ago she was taken by a witch and put in a distant tower. She does get rescued by it is not by a price. 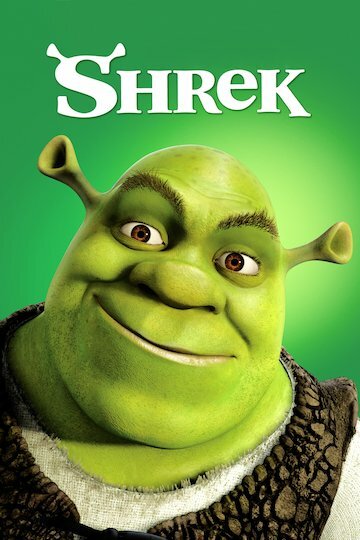 It is by Sherk who is an ogre. The handsome price gets Shrek to rescue the princess. Along the way he meet Donkey who is loveable but annoying. Shrek and Donkey reach the princess and she thinks she is being rescued by the man of her dreams. Shrek and Donkey have to fight a dragon to get to the princess. Donkey is able to sweet talk the dragon into letting them pass. When she see what Shrek really is she cannot help but be disappointed. Fiona would disappear at night. Part of the spell that was placed on her was that she would also turn into an ogre at night. The princess is not used to the crude ways of Shrek but she starts to fall for him. While they are traveling back to the kingdom Fiona and Shrek start to like each other. Shrek still feels that he is better off going home alone to his swamp and does not tell the princess that he is beginning to have feelings for her. Fiona is about to marry the prince but the ceremony gets interrupted by a dragon. Shek along with Donkey end up saving Fiona and the kingdom. The kingdom is afraid of Shrek at first because he is an ogre. Then Fiona came out in her ogre form and surprised everyone even her parents the king and queen. While they were startled they accepted their daughter who they have not seen for a number of years. They end up together and even Donkey ends up being happy with the dragon. The kingdom is saved and everyone is happy. This movie is voice by some famous actors including the voice of Cameron Diaz , Mike Myersand Eddy Murphy. The entire movie is animated by use of a computer. The movie is based on a story written by William Steig with the same name. This movie has a little humor for the adults mixed in with this kid friendly movie. Shrek is currently available to watch and stream, buy on demand at Amazon, Vudu, Google Play, iTunes, YouTube VOD online.